The Lake County Division of Transportation (LCDOT) closed Fairfield Road from IL 176 to Old McHenry Road, to through traffic on Aug. 7. While the road is closed, LCDOT will be replacing two culverts. Each culvert replacement is estimated to take one week. The road will reopen by midnight Aug. 20. Aug. 7 – 13: The first road closure will be on Fairfield Road from Kruger Road to Old McHenry Road. Aug. 14 – 20: The second road closure will be on Fairfield road from Schwerman Road to Milton Road. 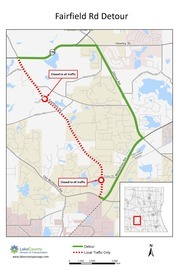 Detour Route for both closures:IL 176 to Gilmer Road to Midlothian Road to Old McHenry Road.